A recipe from Monique van der Vloed. 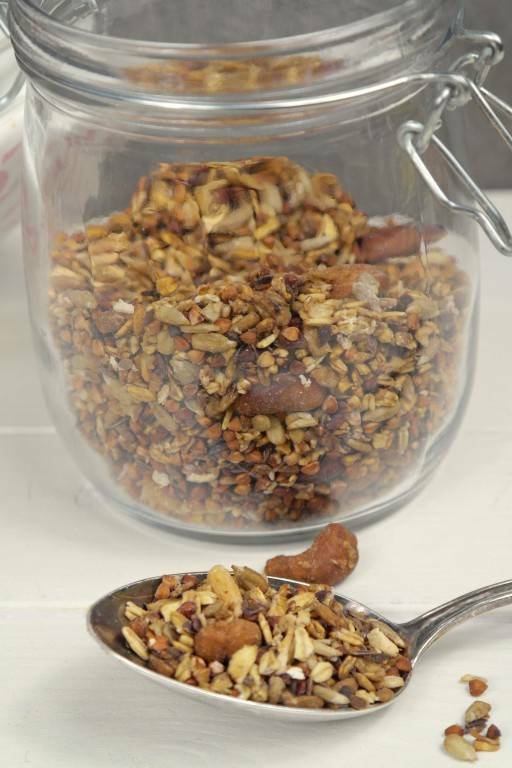 Granola from the airfryer. She has included Greensweet Erythritol. Line the bin lift with baking paper. Put all the seeds and nuts and seeds and the oatmeal into a bowl. I used about half a cup per type, but you can use more or less. However, do not overfill the bucket lift. Put the erythritol in a saucepan and add 20 ml of water to it, dissolve the sugar on a high heat. Pour the hot sugar over the seed mix in your bowl and mix very well. Deposit everything in the box elevator. Set the temperature to 170 degrees. Set the time to 14 minutes. Continue to check every 3/4 minutes by pulling the container out and scooping the granules. Keep repeating this until the granules are nicely discolored and golden brown has become crispy. Return the granules to the bowl and allow to cool. Store in a glass, well sealable jar at room temperature.